Windows 8’s full-screen Start screen was one of the most contentious parts of the operating system, ditching the tried and true desktop Start menu in favor of something more mobile-friendly—and alien to longtime PC users. Windows 10 walked back Windows 8’s sins by reintroducing the Start menu and cramming Windows Store apps into proper desktops windows, but not everyone will appreciate the change. Fortunately, Microsoft’s new operating system still packs a Tablet Mode that functions like a slightly tweaked Start screen, replete with Live Tiles and Windows apps that expand to fill your display. You can enter it by selecting the Tablet Mode button in Windows 10's new Action Center—or go even further if you never want to spend time on the traditional desktop. Whether you’re a Windows tablet user or simply found that the Start screen grew on you over time, here’s how to boot into Windows 10’s Tablet Mode straight from startup. First, open the Settings app. (You’ll find it in the Start menu if you’re in desktop mode, or you can simply search for it with Cortana.) Then select the System option, and click on Tablet Mode in the left-hand navigation pane. 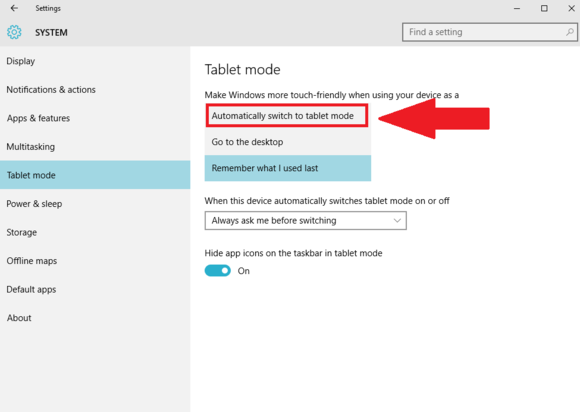 You’ll see a few options related to how Tablet Mode behaves. Feel free to peruse and tweak these, but you’re looking for the “When I sign in” setting. Click it to open a drop-down menu, and select the “Automatically switch to Tablet Mode” option. From now on, exactly that will happen every time you boot up your PC. 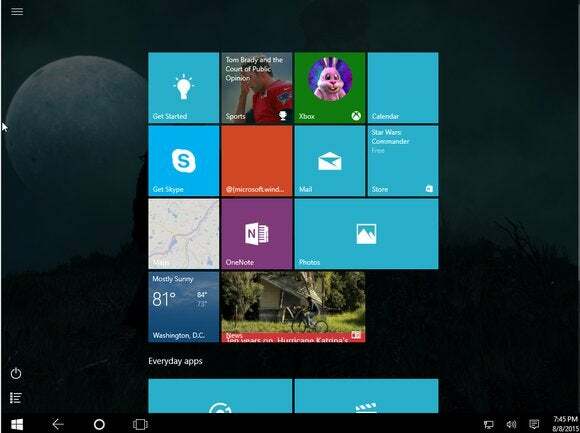 Want to explore more of Windows 10’s myriad new features and secrets? Check out PCWorld’s walkthroughs of Windows 10’s best tips and tricks, the 10 best new features you’ll want to try first, the 12 obscure new features designed to erase hassles, and the slick “new to you” technical improvements you’ll find if you’re upgrading from Windows 7.